This guide is written for anyone using the Security Token Service in AM to manage token exchange. Click Add SOAP STS Agent to create a new agent. Specify an agent ID and password. You can find information about downloading and compiling the AM source code on the forgerock.org website. The website also lists prerequisites for compiling the source code. Make sure that your system meets these prerequisites before proceeding. This section references STS code examples. The sample code referenced in this section provides an example of how to programmatically publish REST STS instance. The code is not intended to be a working example. Rather, it is a starting point—code that you can modify to satisfy your organization's specific requirements. To access the sample code, see To Access the STS Example Code. The sample code imports a number of classes, introducing dependencies. Classes imported from the AM API can remain in your code, but other imported classes must be removed and replaced with code that provides similar functionality in your environment. For example, the RestSTSInstanceConfigFactory class uses a constant named CommonConstants.DEFAULT_CERT_MODULE_NAME from the imported com.forgerock.openam.functionaltest.sts.frmwk.common.CommonConstants utility class. This utility class is not publicly available. Therefore, you need to replace this constant with another construct. The sample code referenced in this section provides an example of how to programmatically publish of a SOAP STS instance. The code is not intended to be a working example. Rather, it is starter code that you can modify to satisfy your organization's specific requirements. To access the sample code, see To Access the STS Example Code. The sample code imports a number of classes, introducing dependencies. Classes imported from the AM API and the SOAP STS client SDK can remain in your code, but other imported classes must be removed and replaced with code that provides similar functionality in your environment. For example, the SoapSTSInstanceConfigFactory class uses a constant named CommonConstants.DEFAULT_CERT_MODULE_NAME from the imported com.forgerock.openam.functionaltest.sts.frmwk.common.CommonConstants utility class. This utility class is not publicly available. Therefore, you need to replace this constant with another construct. The RestSTSConsumer.java sample code provides an example of how to consume a published REST STS instance programmatically. Tailor this example as required to provide programmatic consumption of your own REST STS instances. To access the sample code, see To Access the STS Example Code. Locate the openam-soap-sts-client-6.5.jar file in the openam-sts/openam-soap-sts/openam-soap-sts-client/target directory. The SOAP STS client SDK has a dependency on Apache CXF classes, which is not present in the AM API. Several sections in this chapter reference STS code examples. To access the example code, see To Access the STS Example Code. The Deployment Url Element is a component of the SOAP STS instance's endpoint. For example, if you specified mySOAPSTSInstance as the Deployment Url Element, the SOAP STS endpoint would be /SOAP STS .war File NamemyRealm/mySOAPSTSInstance. These properties are available in both the REST and STS configuration pages. Specifies an audience attribute value. Populates the AudienceRestriction sub-element of the Conditions element of the SAML v2.0 assertion. Specifies a recipient attribute value. Populates the Recipient sub-element of the SubjectConfirmation element of the SAML v2.0 assertion. 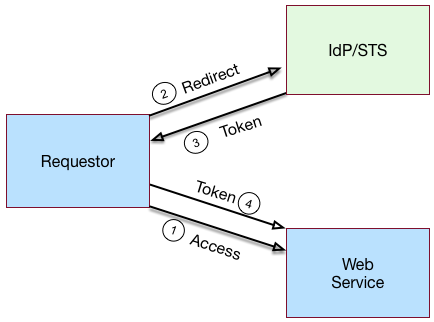 Implicit in this model is the notion that an OpenID Connect ID token has value outside of an OAuth 2.0 flow, and that an OAuth 2.0 client, as a relying party, could be generalized as a SAML v2.0 service provider. The ID token is not simply an an entity-provided verifiable authorized access to a specific resource, but rather a generic service provider that consumes an OpenID Connect ID token to authenticate and authorize the subject asserted by the token. Copyright © 2014-2019 ForgeRock AS.